It was one of those weeks! No fun baking happened here, just trying to make-do and get something on the table to feed my people. We did some cleaning out of the refrigerator and creative meal fixing. We had what we call “People’s Choice”. Let me define the term “People’s Choice”, coined by my mom sometime in my childhood. I must preface this description by saying that I have a very creative mother. She is smart and clever and always in pursuit of making things fun. When I was growing up, she made cleaning the house a race in our home (with estimated times, kitchen timers set, tasks assigned and music playing) and made tasks more bearable with singing and assigning creative names to things. Dave says, “just imagine Maria from The Sound of Music” – playclothes made from old draperies, picnics on the hillside, learning music theory by dancing up steps, overcoming the fear of storms by singing of woolen mittens… you get the picture? Growing up, a half sandwich (one piece of bread, folded over) was far more fun if called a “foldy”… it still is, actually. A melted ham and cheese sandwich on a bun called a “yumbo” sounded like party food. Mom could take the ordinary and make it memorable. She still can. One of her mainstays was “People’s Choice”. Did I also mention that she is also very positive? She’s a lemonade-out-of-lemon kind of a lady. (And she doesn’t like wasting or throwing things away.) People’s Choice is the name my mother coined for leftovers. Rather than “left-over night” being a disappointing, re-heating of seen-before-meals, her people’s choice was a free-for-all of the leftovers from the previous days, with the addition of some fresh fruit or salad, at times, to complete the meal. And it worked. It wasn’t dreadful. It was actually kinda fun. People’s Choice infers that you have the power to choose. Whatever meal you most enjoyed during the previous days, you can stake your claim on it. It is almost like working a puzzle (which we happen to really like too). This is done with the goal in mind of trying to see if you can clear out all of the containers – or at least some of them – and feed all the people at the table something they would enjoy. This meal requires only 10 to 15 minutes to prep, you are cleaning out the fridge, while simultaneously reducing waste and feeding a household! So, of course, we carry this tradition on in our home and when the fridge is full of containers of leftovers, and we don’t have the time or energy to invent a new meal. We declare that it is People’s Choice night! Hip Hip Hooray! 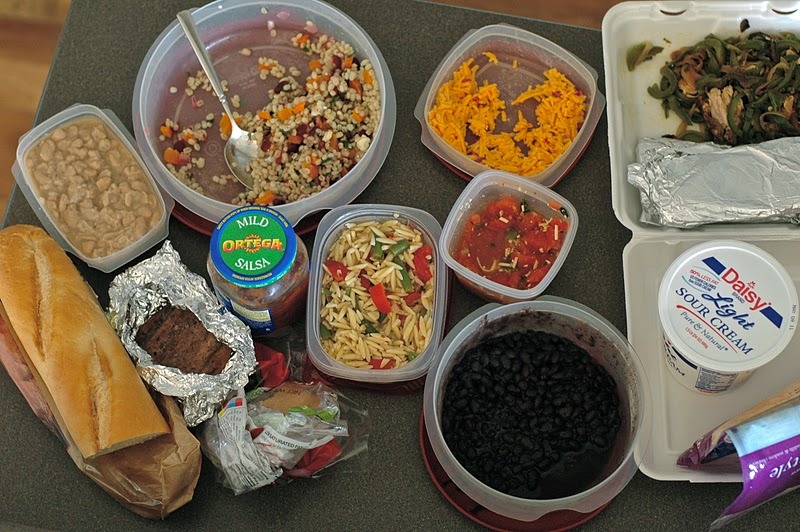 (or below: some leftover pasta salad, barley salad, beans – from a home-cooked meal, paired with fajita peppers and onions brought home from a Mexican restaurant, and some bruschetta. Something for everyone!) I know you might be thinking, “you brought home peppers and onions from the restaurant?” Yes! We had eaten most of the meat and the trimmings but had a pile of peppers and onions left, which we paid for, that could make some nice veggie tacos at home. So remember, when you need to clean out those leftovers in your fridge and you just have a little of this and a little of that and no time or energy to create a new meal … think People’s Choice! And exercise your power to choose! We still use “People Choice” and “foldy” at our house. Thanks for the hints so many years ago. In fact, my sisters caught on while they were visiting and are using these terms of endearment at their house. Loving the blog!